Almost any Christian can tell you something about the Resurrection. They know certain parts of the story—that Jesus died and rose again—but not enough to apply God’s powerful truths to the way they live and believe. Christ’s resurrection has radical consequences, not just for eternal life, but for our everyday life. For without the Resurrection, there would be no grace, no power, no joy, no peace, no hope, and no real life. You can imagine what that would be like, if you remember what life was like before Jesus saved you and filled you with the Holy Spirit. Think about the weight that sin carries in our lives. Shame, guilt, and condemnation come with everyday life. We can’t get away from it. However, the Resurrection provided our justification. Not only are our sins atoned for on the cross, but by His Resurrection, we are justified—meaning, to God, it’s as if we had never committed those sins. Therefore, because Jesus was resurrected, Christians are resurrected into newness of life—every day! What a great and powerful truth. Yet often Christians don’t experience this newness in everyday life. I admit there are days when I wonder, “Is this really newness of life? I’m frustrated, cranky, disappointed, depressed.” Try as we might, we don’t personally possess the power to renew our lives. We can’t simply make ourselves new. That comes from the grace of Jesus alone—and it’s called resurrection power or the filling of the Holy Spirit. Jesus is the Resurrection and the Life, so we must turn to Him for these things. It helps to remind ourselves: “Jesus paid it all.” He finished the work of salvation. He rose again, conquering death, and He is alive! After returning to Heaven, He has sent His resurrection power, the Holy Spirit to be in us. We should die to self and ask God to fill us with the Holy Spirit every day. If we don’t, we are missing out on one of the most powerful effects of the Resurrection—the Life and Power of Jesus Christ in us. 1 Cor. 15:1-24 Now, brothers, I want to remind you of the gospel I preached to you, which you received and on which you have taken your stand. By this gospel you are saved, if you hold firmly to the word I preached to you. Otherwise, you have believed in vain. For what I received I passed on to you as of first importance: that Christ died for our sins according to the Scriptures, that he was buried, that he was raised on the third day according to the Scriptures, and that he appeared to Cephas, and then to the Twelve. After that, he appeared to more than five hundred of the brothers at the same time, most of whom are still living, though some have fallen asleep. Then he appeared to James, then to all the apostles, and last of all he appeared to me also, as to one abnormally born. For I am the least of the apostles and do not even deserve to be called an apostle, because I persecuted the church of God. But by the grace of God I am what I am, and his grace to me was not without effect. No, I worked harder than all of them—yet not I, but the grace of God that was with me. Whether, then, it is I or they, this is what we preach, and this is what you believed. But if it is preached that Christ has been raised from the dead, how can some of you say that there is no resurrection of the dead? If there is no resurrection of the dead, then not even Christ has been raised. And if Christ has not been raised, our preaching is useless and so is your faith. More than that, we are then found to be false witnesses about God, for we have testified about God that he raised Christ from the dead. But he did not raise him if in fact the dead are not raised. 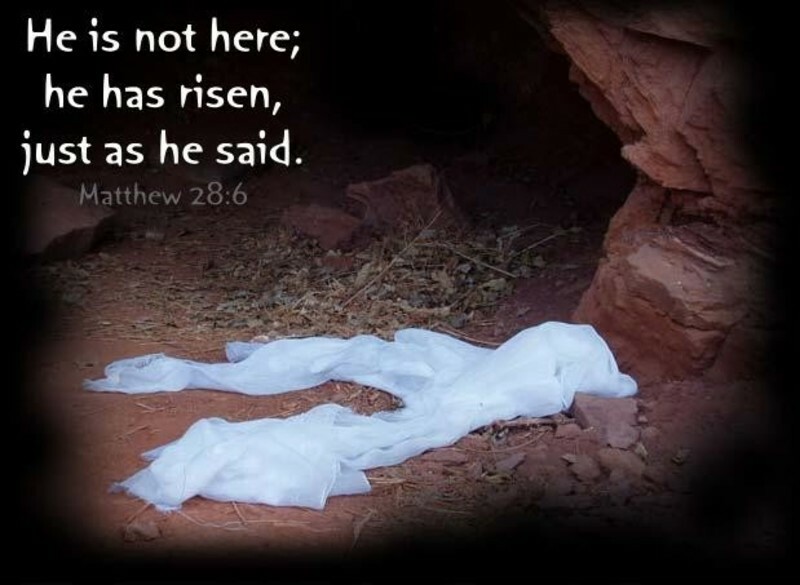 For if the dead are not raised, then Christ has not been raised either. And if Christ has not been raised, your faith is futile; you are still in your sins. Then those also who have fallen asleep in Christ are lost. If only for this life we have hope in Christ, we are of all people most to be pitied. But Christ has indeed been raised from the dead, the firstfruits of those who have fallen asleep. For since death came through a man, the resurrection of the dead comes also through a man. For as in Adam all die, so in Christ all will be made alive. But each in turn: Christ, the firstfruits; then, when he comes, those who belong to him. Then the end will come, when he hands over the kingdom to God the Father after he has destroyed all dominion, authority and power. This Scripture says boldly that without Christ’s resurrection there would be no reason to be a Christian at all. If it had not been for the Resurrection, the ministry of Jesus would have ended, His claims would have been ignored, He would have been merely another religious martyr, and He would have been forgotten long ago. That is what the Jewish leaders hoped to accomplish by denying the resurrection of Jesus. There are voices today that say it doesn’t matter whether there was a Resurrection. Paul rejects this in the strongest possible terms. He says that if Christ was not resurrected the consequences are dire. Christ is either risen or He’s not—and if he isn’t, then our sins were never forgiven. Some object, “But Jesus’ death took care of my sins. My forgiveness doesn’t depend on the resurrection.” Paul says it does: “For if the dead are not raised, then Christ has not been raised either. And if Christ has not been raised, your faith is futile; you are still in your sins. Then those also who have fallen asleep in Christ are lost. If only for this life we have hope in Christ, we are of all people most to be pitied. The reason that Jesus’ death on the Cross has power to atone for our sin is the fact that He rose from the dead, conquering death, sin, and the devil! There are several disastrous consequences that would result if Christ was not raised from the dead. The first would be that faith in Him would be vain, empty, fruitless, to no purpose. A dead savior could not give life. If the dead do not rise, Christ did not rise, and we will not rise. Apart from the Resurrection, Jesus could not have conquered death, and death would forever be man’s conqueror. Without the Resurrection, there would be nothing worth preaching. Unless our Lord conquered sin and death, making a way for men to follow in that victory, there is no Gospel to proclaim. If there was no Resurrection, the hall of the faithful in Hebrews 11 would instead be the hall of the foolish. Abel, Enoch, Noah, Abraham, Sarah, Moses, Rahab, David, the prophets, and all the others would have been faithful for nothing. They would have been mocked, scourged, imprisoned, stoned, afflicted, ill-treated, and put to death completely in vain. All believers throughout all ages would have believed for nothing, lived for nothing, and died for nothing. If there is no such thing as the resurrection of the dead, then every person who claimed to have witnessed the risen Christ and every person who preached the risen Christ is a liar, including Paul and the other apostles. If there was no Resurrection, they were fools to die for a lie they could have easily denied. If Christ was not raised from the dead, then Christians would be no better off spiritually than non-Christians. If Jesus didn’t rise from the dead, then sin won the victory over Him, and therefore, sin will continue to be victorious over all men. If Jesus remained dead, then when we die, we too will remain dead and condemned. And if we remain dead, then death and eternal punishment are the only prospect for believer and unbeliever alike. If Christ was not raised, then He didn’t bring forgiveness of sins, or salvation, or reconciliation, or spiritual life, either for now nor for eternity, because He is dead. If Christ is still dead, then He not only cannot help us in regard to the life to come but He cannot help us now. If He cannot grant us eternal life, He cannot improve our earthly life. The Christian life would be a mockery, a charade, a tragic joke. Unfortunately, this is what unbelievers think about Christianity. A Christian has no Savior but Christ, no Redeemer but Christ, no Lord but Christ. Therefore, if Christ was not raised, He is not alive, and our Christian life is pointless. We would have nothing to justify our faith, our Bible study, our preaching, our service for Him, or our worship of Him, and nothing to justify our hope either for this life or the next. We would deserve nothing but the pity reserved for fools. But we are not to be pitied, for the fact is: God did raise Jesus our Lord from the dead, who was crucified because of our offenses, and was raised for our justification. But Christ has indeed been raised from the dead, the firstfruits of those who have fallen asleep. For since death came through a man, the resurrection of the dead comes also through a man. For as in Adam all die, so in Christ all will be made alive. The fact that Jesus is the first fruits indicates that the rest of the crop is going to be harvested! His resurrection implies that there is more to follow. Death is not the end! Just as Adam was the forerunner of everyone who dies, Christ is the forerunner of everyone who will be raised to life. Adam brought death into this world and all of our bodies will die. But Christ brought eternal life into this world, and all Christians will continue to live through Him. There’s a story that’s told in Brazil about a missionary who discovered a tribe of Indians in a remote part of the jungle. They lived near a large river. The tribe was friendly and was in need of medical attention. A contagious disease was ravaging the population and people were dying daily. A hospital was located in another part of the jungle and the missionary determined that the only hope for this tribe was for them to go to the hospital for treatment and inoculations. In order to reach the hospital, however, the Indians would have to cross the river, something they were unwilling to do. They believed that the river was inhabited by evil spirits. To enter the water meant certain death. As the story goes, the missionary began by explaining how he had crossed the river and arrived unharmed. No success. So he led the people to the bank and placed his hand in the water. The people still wouldn’t believe him. He walked out into the river and splashed water on his face. The people watched closely, but still, they were hesitant. Finally, the missionary turned and dove into the water. He swam beneath the surface until he emerged on the other side. Having proven that the power of the river was a farce, the missionary raised a triumphant fist in the air. He had entered the water and escaped. The Indians broke into cheers and followed him across. As a result, they were saved. Jesus came into this world to a people enslaved by their fear of death. He could have explained that the river of death was nothing to fear, but people wouldn’t believe Him. He touched a boy and called him back to life, but His followers were still unconvinced. He brought life into the dead body of a girl, but the people were still cynical. He even let a dead man spend four days in a grave and then called him out. Was that enough to believe in the Resurrection? Apparently not. For it was still necessary for Jesus Christ Himself to enter the river, to submerge Himself in the waters of death only to emerge after three days on the other side. Then and only then could we believe that He had conquered death and possessed eternal life. Hebrews 2:14-15 Since the children have flesh and blood, he too shared in their humanity so that by his death he might break the power of him who holds the power of death—that is, the devil—and free those who all their lives were held in slavery by their fear of death. Our Savior, Jesus Christ, came to give us much more than redemption. He came so that we might have the fullness of resurrection life every day. That doesn’t mean we no longer experience pain or sorrow. Every Christian will continue to face temptations and hardships. But in the midst of our trials, we’re able to abound with thanksgiving, because of His everlasting grace toward us. The Resurrection gives us hope and faith in God’s Word. If there was not a resurrection, then it doesn’t matter whether there was a literal Ark or a six-day creation period or an actual Garden of Eden. If Christ’s resurrection didn’t take place, none of those things matter at all. But if there was a resurrection, then those things happened, Lazarus was raised, people were healed, sins are removed, and Heaven is a reality. An effect of the Resurrection is that everything Jesus said and did is possible and will come to pass. So no matter how dreadful the world is around us, we have hope because of the Resurrection. It is essential that we come to a decision in our own minds in regard to the Resurrection of Christ. Either He rose from the tomb, or He didn’t. That doctrine is central to the Christian faith. The resurrection is not just an additional event in the life of Jesus, but the culmination and consummation of the work of Jesus. No one took Jesus’ life; He gave it. No one raised Jesus from the dead; He conquered death and came out of the grave Himself. Then He gave this Resurrection Life and Power to all who would believe in Him. Are you experiencing the effects of the resurrection in your everyday life? If we don’t put our faith and focus on Jesus Christ, we won’t experience what His resurrection won for us. So many in the Church today live as if they’ve accepted defeat. Their thoughts are ruled by doubt rather than belief. They live with habitual patterns of sin. They keep their faith to themselves, thinking if they struggle so badly, how could they possibly help someone else? This is what the Christian life looks like without resurrection power. Actually, that’s what the disciples’ lives looked like after the crucifixion. So what was the first thing Jesus did after the Resurrection? He dealt with his followers’ doubt and fear. The power of the Resurrection is that Jesus is alive. He is a living Savior, and He lives in us! He gives us true, solid peace that frees us from all fear. In turn, He breathes into us His own Spirit, empowering us as His witnesses. That is the greatest effect of the resurrection! Are you experiencing it? If not, repent of all sin that is keeping you from experiencing this Resurrection life. If you haven’t made Jesus your Savior, confess Him as the Son of God, who atoned for your sin. Begin following Him by dying to self in baptism and be raised unto a new life, born of the Holy Spirit. Then you will begin experiencing Christ’s resurrection in your own soul.